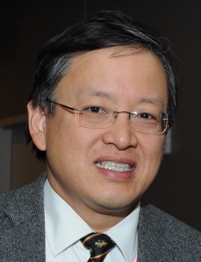 Baritone James Liu is a physician with varied musical interests. He has announced and produced classical music programming at WHRB. He has sung in many choruses, currently the Cantata Singers and the Choir of First Church in Boston whose services can be heard every Sunday on WERS. His art song repertoire includes Die schöne Müllerin, Winterreise, Dichterliebe, Histoires naturelles and Don Quichotte à Dulcinée. He has appeared with Indian Hill Music, Lowell House Opera, Harvard Early Music Society, Opera del West, Longwood Opera, Opera51, Boston Opera Collaborative, and Opera Boston. Roles include The Magic Flute (Second Man in Armour, Papageno), The Marriage of Figaro (Antonio, Bartolo, Almaviva), Così fan tutte (Guglielmo, Alfonso), Fledermaus (Dr. Falke), Gounod's Faust (Valentin) and Roméo et Juliette (Capulet), Verdi's Otello (Montano) and Falstaff (Pistola), Ariadne auf Naxos (Music Teacher), Hansel and Gretel (The Father), Fidelio (Don Fernando), and John Eccles's Semele (Jupiter). He is indebted to his voice teacher, Frank Kelley, and to his infinitely patient wife who makes all of this possible. You can download a PDF of my performance resume from my Boston Singers' Resource page. You can see and hear various performances in a playlist posted on Playmoss. Handel Messiah Bass soloist Various groups December 2009 etc. Cantata Singers, Boston MA, 2008 - present. Choir of First Church in Boston, Boston MA, 2010 - present. Cappella Clausura, Boston MA, 2011. New World Chorale, Boston MA, 2006 - 2008. Back Bay Chorale, Boston MA, 1995 - 96, 1999 - 2008. Yale Camerata, New Haven CT, 1997 - 1998. Yale Glee Club, New Haven CT, 1996 - 1997. Rutgers Concert Choir, Piscataway NJ, 1991 - 1993. Rutgers Collegium Musicum, Piscataway NJ, 1990 - 1991. National Cathedral Men's Choir, Washington DC, Summer 1990. Rutgers University Choir, Piscataway NJ, Spring 1990. Harvard-Radcliffe Chorus, Cambridge MA	1985 - 1989, 1994 - 1995. First Church in Boston, MA. August 2012: Organized the Order of Service and delivered a sermon titled "Doubt: Its Use and Abuse." DMC Productions, LLC, Boston, MA, 2010. Voice-over work for a documentary titled Bruno Droste: An Artist's Flight to Freedom. WHRB-FM, Cambridge MA, 1986 - 1990, 2000 - present. Recorded spoken text for audio tapes to accompany English textbooks for mainland Chinese market. Archive of classical music concert reviews at The Boston Musical Intelligencer.